Line 6 presents the Relay G70, a wireless receiver stompbox described as 5 pedals rolled into one. Sennheiser is calling on bands and artists to trial and review its D1 wireless digital microphone systems. Shure announced that its QLX-D Digital Wireless Systems will be available in the 900 MHz ISM frequency band. 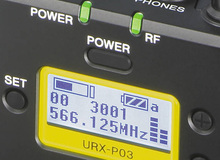 Audio-Technica is about to launch AT-One, its new UHF wireless system. Neutrik upgrades its Xirium multifunction wireless audio network system in a new X version. The new Shure PSM300 wireless in-ear personal monitoring system features two models that operate at a 24-bit audio resolution. The new Shure QLX-D series of digital wireless systems features three systems for voice, guitar and brass/woodwinds. Sennheiser will release in a few weeks a Dante expansion card for the Digital 9000 wireless systems, which was unveiled at IBC. Shure offers users of its wireless systems a remote control app for iPhone, iPod Touch and iPad. Behringer announces that its Ultralink ULM100USB wireless microphone introduced at NAMM last year has started shipping to the retailers.